Instead of buying my kids lots of "stuff", I'll invest in experiences. Visiting the Whitsundays, in Queensland, was on our family's bucket-list. The treasure: The Great Barrier Reef. This is one of the seven wonders of the world. It's easy to reach for Kiwis. It's about a 3hr flight to Brisbane and 1hr 15m flight to Whitsunday Coast Airport (Proserpine). Here are some highlights on what to do, where to stay and eat for a family. After arriving at Proserpine, we drive in a hire car for 50 minutes to Bowen. This place is famous for a giant mango which cost $90,000 to make. We loved eating frozen mango here. The area is renowned for mangos, and growing lots of other vegetables and fruits. Nearby, you feel in paradise on the beach at Rose Bay or Horse Shoe Bay with clear sea views for miles. Swimming at Horse Shoe Bay was so incredible my son Lachie, 10, asked "can we stay forever?" We slept at the Rose Bay Resort which boasts a great pool, palms and sea views. I watched over the balcony as my kids splashed in the pool and then looked out to sea to try and spot whales. For cheaper accommodation in Bowen, you can stay at Queen's Beach Tourist Village. This is only a short stroll to sandy beaches, playgrounds and tennis courts. I met a guy here who has visited yearly for 26 years. It's so beautiful and there's so much sea adventures on your doorstep. Rachel Grunwell with her son. Up Flagstaff Hill, you can view the bays of Bowen. You can see endless blue seas and the stunning curves of many islands. We had a great dinner at the Grand View Hotel nearby. This is famous for being in Baz Luhrmann's film Australia, starring Nicole Kidman. This charming and renovated building is an old-Queenslander-style beauty. For good coffee and a family-friendly menu, we enjoyed two places in town: The Le Sorelle Coffee House has a great playground on site and awesome menu, while the Sails on Main has a cool nautical theme, boats on display and also good kai. For dinner, you can't beat fish-and-chips at Birds Fish Bar. Here you eat just-caught seafood overlooking the beautiful Bowen Harbour, fishing boats and watching the sunset here is magic. From Bowen, we drove 50 minutes to Airlie Beach, the gateway to the Whitsunday Island cruises. Walking along the Airlie Esplanade, beside the beach, is bliss. An amazing local café for smoothies, salads and fresh, healthy food is Bohemian Raw Café. We came here three times! The Great Barrier Reef was better than we imagined. The moment my son Zach, 12, swam with a giant humphead wrasse fish (and other fish and coral of all rainbow colours) was magic. Finn, 6, squealed over turtles coming close. He also loved the underwater viewing observatory and semi-submersible (like a submarine). Cruise Whitsundays offers an incredible all-day adventure to 'reef world'. This is a giant platform in the ocean, which caters for all activities, a buffet lunch and so many adventures. If you have a bigger budget, you can hire a helicopter or go diving. There are 74 island wonders in the Whitsundays. Another we will remember forever is Whithaven Beach. Cruise Whitsundays does a half-day trip here. The sand is 98 per cent silica, a cool temperature and has the same texture as coconut-flour. The water is postcard-perfect. The white sand and aqua waters will be something I dream of returning to again. 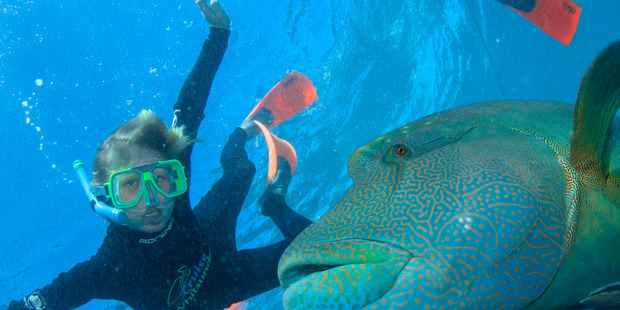 A great family-friendly place is the 26-acre BIG4 Adventure Whitsunday Resort. This boasts pools, a new mega waterslide park, go-carts, mini-golf, tennis, outdoor movies, jumping pillows, and a kids' club. There is camping, caravanning to luxury cabins. This place is so entertaining for kids. My kids met new friends here and had so much fun. While they enjoyed a movie here one night, I walked 10 minutes up the road to Yoga Therapies. This 90-minute yin yoga session was a highlight for me. The accommodation highlight for my husband and I was the Mantra Boathouse Apartments. You look out over the Port of Airlie Marina and the hotel and pool facilities are swish. We had five cockatoos land on our terrace in the morning. I'm not sure who was more delighted - the bloke or the kids. Ten minutes walk away is the Anchor Bar and Grill. There's a cheap kids' menu and relaxed and friendly atmosphere here. Rachel's trip was supported by Tourism Whitsundays.